Your car’s brake system is a complex grouping of parts which serve a critical role in keeping you safe. This will be a brief explanation of how everything works from the brake pedal on down to the braking system in easy to understand terms that we hope will make sense to you. 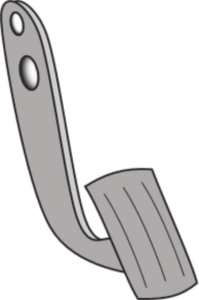 This is a strong steel lever which transmits the force from your foot to the master cylinder. Simply put, when you push down on the brake pedal, the master cylinder is pushed via a push rod. The master cylinder consists of a piston and a fluid reservoir. When the piston is moved, it pushes the brake fluid through the brake lines and into the “brake calipers” or “wheel cylinder”. The brake pads are typically made from a hard organic or metallic compound. You can probably imagine the kind of heat friction that builds up when force is applied to the brakes so it makes sense that they are made to survive under high heat and pressure. When the brake pads make contact with the rotor, there is friction and heat is created. This is how your car stops. Your car’s tires affect your ability to brake safely along with the handling of your vehicle and the ride. They must be checked regularly for correct air pressure, tread depth, balance, and alignment. Brake Wear: The braking system does a lot of work and the brake pads take the brunt of the abuse. You need to have your brake pads checked every 6 months or whenever you suspect a problem. Symptoms of wear can include squeaking, grinding, or increased stopping distance. Most brake pads have a thin metal tab which vibrates against the rotor when the pads wear down to a dangerous level. However, some manufactures brake pads do not have this tab and if not checked periodically can wear down far enough to ruin the rotors. A modern trend is to make the brake pads very hard thus extending life. This harder material sometimes squeaks and sounds like the wear indicators mentioned above. Another common cause of brake squealing is simple brake dust. Brake dust can be eliminated by simply spraying brake cleaner on the brake system to remove the dust however caution on the side of error and have any sounds checked out by your auto repair technician. Warped Rotors: More common in newer cars, but possible on all disc brake systems. Rotors warp due to being overheated or the incorrect tightening of the wheel. A warped rotor will give a pulsing feeling when applying the brakes. This pulsing can be annoying AND dangerous. 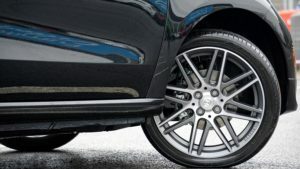 In an effort to cut costs, many new cars have rotors which are very thin and warp very easy. In addition, the manufacturer has not left enough material to resurface the rotor so in many cases, the rotors will have to be replaced when they warp. Check with you mechanic and ask if he recommends having the rotors machined or replaced with new rotors. It is a matter of safety. If your auto repair shop will be resurfacing the rotor, the warped rotor will be mounted on a lathe and a cutting tool will remove a thin layer of material from the braking surface. This restores the flatness of the rotor and eliminates the pulsing sensation in the pedal. Make sure when your mechanic puts everything back together that he torques the lug nuts to the proper specifications and that he never uses an impact wrench. If the lug nuts are not tightened evenly the rotor can warp again from the uneven pressure and you’re back right where you started. Note: Some shops use a torque stick, which attaches to an impact wrench and does not allow the torque wrench to tighten more than it should. This is acceptable. If your mechanic does not use a torque wrench or torque sticks, find another mechanic. Tires: The most common problems with tires are over inflation, under inflation, and tread wear. 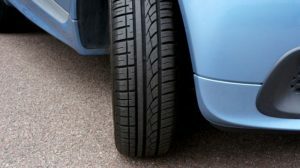 It’s important to note how and where the tread is worn as this may indicate that your tires have not just worn out, but that there might be another problem such the vehicle being out of alignment, or a belt has separated within the tire. These kinds of problems can be addressed by a visual inspection which should be done on a monthly basis. When you drive your car, listen to your tires. If you hear a vibration or thumping noise, this could indicate an out-of-balance tire, your tire having a “flat spot”, especially if you have recently had to slam on the brakes to stop in an emergency situation, or a belt problem in the tire. Also, pay attention when you are driving at a steady speed on a flat road whether the car pulls to one side. This can indicate that your tire is under-inflated, or may be damaged on the side it is pulling to. If neither of these problems are evident upon a visual inspection, you may have a brake problem or your wheels may be out of alignment. Remember that tires depend on having good tread depth to maintain traction and shed water when roads are wet. You can get a thread depth gauge at any auto parts store or you can use the coin tests. Insert a quarter into the tread groove with the top of George Washington’s head facing down. If the top of his head is not visible, then your tires are fine and have at least 4/32 inch of tread. If you can see above the top of his head, it’s time to consider new tires. Be sure to check this measurement at the outer edge of the tire as well as the center, and inside edge. If you don’t have a quarter handy to check the tread, a penny can also be used. It’s basically done the same way except that if you can’t see the top of Abraham Lincoln’s head you are in need of tires ASAP. This indicates that the tires have less than 2/32 in of tread which is below the legal minimum. The difference between 4/32” and 2/32” may not seem like much to you however in a study by The Tire Rack, America’s largest independent tire tester, it can decrease your stopping distance by as much as 377 feet which is quite a distance, especially when traveling at high rates of speed. Avoid “riding” your brakes. It’s better to slow down with moderate pressure and then allow the brake to cool when released than to keep your foot on them constantly. Riding your brakes causes brake overheating. When traveling through areas where there are steep grades, consider downshifting to save on your brakes. Driving in a lower gear allows your engine to do some of the braking giving your brakes a break. Remember though, that’s its only safe to do this when traction conditions are good. Using this method on wet, icy, or snow slick roads can cause skids! Check your tires on a regular basis. At least monthly and more often if you regularly drive long distances, have hit a pothole or run over any debris in the road. Buyer beware of advertised low priced brake jobs. Some shops advertise a brake job with “hidden” charges. Using a mechanic that you trust will always save you money in the long run. The safety of you and your family can depend on the brakes and tires of your car. If you think you might have a brake or tire problem, bring your car in and we can inspect them for you. Just contact us today and we’ll be happy to schedule an appointment.